If you fancy airborne stuff, this is a must for you. 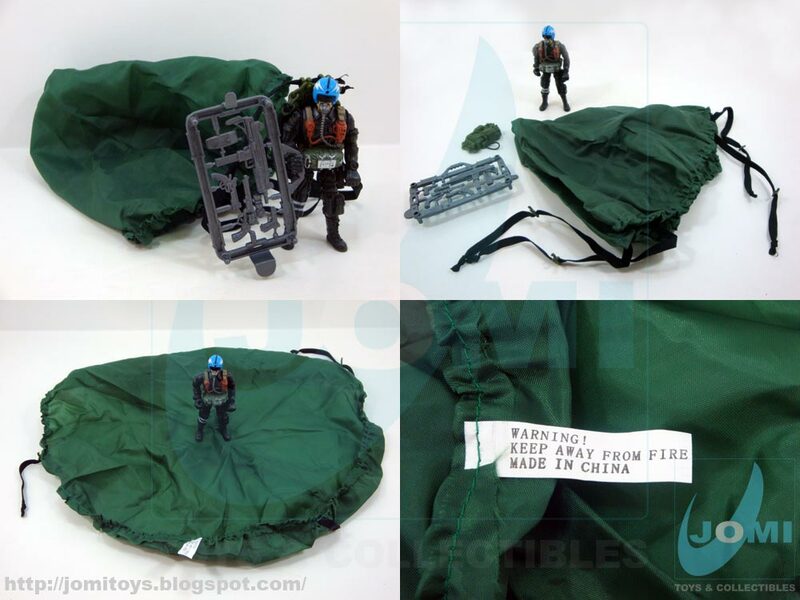 V.2 Chap Mei parachute finally reviewed. And loose too! 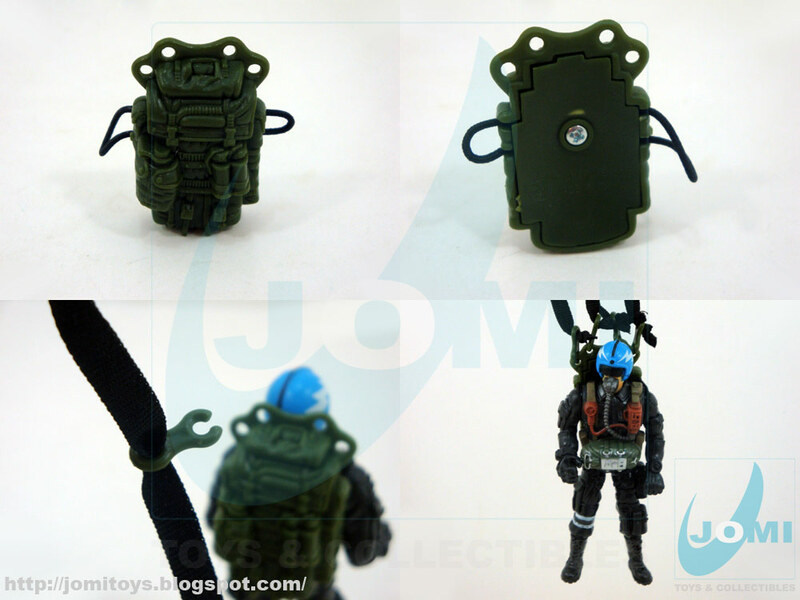 The back of the card (as all carded Chap Mei figures, including 6 packs) is mainly cardboard gray in color. 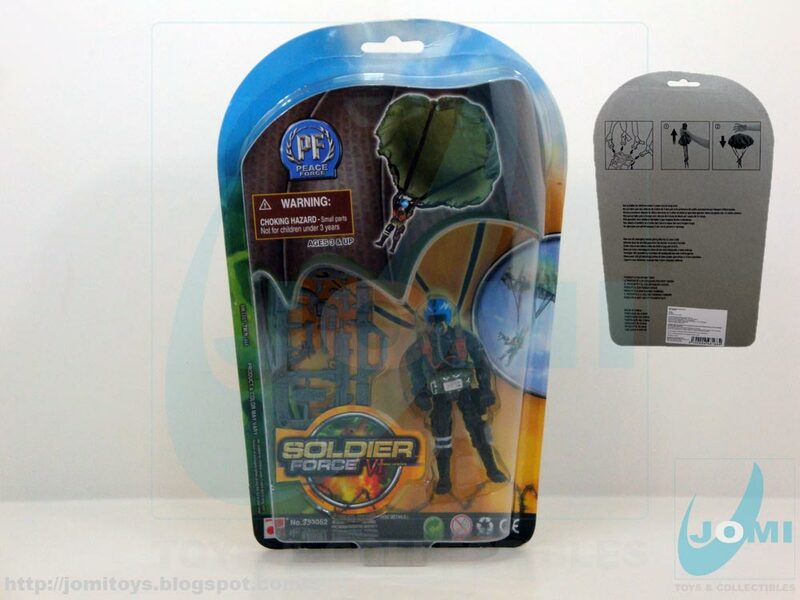 Besides the distributor´s references, printed or in a white sticker, this particular item comes with the instructions for the parachute. 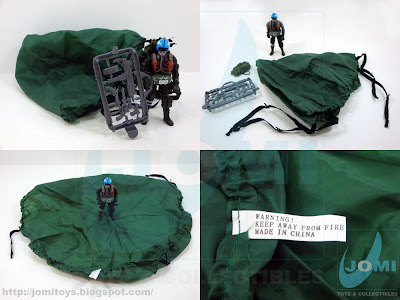 I was a little curious to actually hold the chute´s backpack, since last Chap Mei chutes were pretty much copies of G.I.Joe´s. 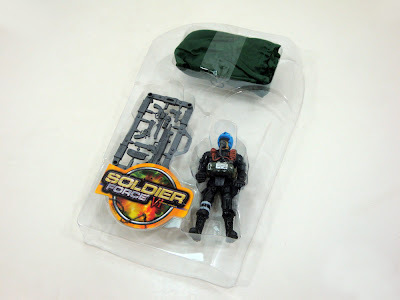 Well, considering that the included figure has been around since "Series III" and viewed and reviewed time and again, I reckon we simply need to take a look at the parachute. However, for a more detailed review of Captain Red A-6, refer to "Soldier Force IV P-40 Combat Fighter Playset". The material used seems to be a thin compact netting polyester. Sort of mosquito netting curtains or umbrella tissue. Well, it´s better than the plastic used in former sets. A curious warning: "Keep Away from Fire"... because it was made in China! The scale of the actual "chute" is similar to the 3 3/4" G.I.Joe line. The parachute pack has really surprised me in a good way. It has some rubber bands to keep it tight to the figure´s arms. The stripes used to emulate the suspension/steering lines however, don´t look very scaled nor minimally realistic. Not good at all. But the goal here definitely seems child-orientated. If every Chap Mei set should be? Basically, probably. But we all know who asks more and better from CM. The collector community. And if you consider the fact you can change these stripes for line, you can actually come up with a very good item here! Scale shots with included Chap Mei figure and RAH G.I.Joe figure. 100% usable! And I´ll have to get my hands on a couple more of these. Not at the current price, though. This is a very cool set, but US$7.5 for doubles is too much. Maybe not a lot, but definitely too much. Finally Altitude got to be around his "thing". 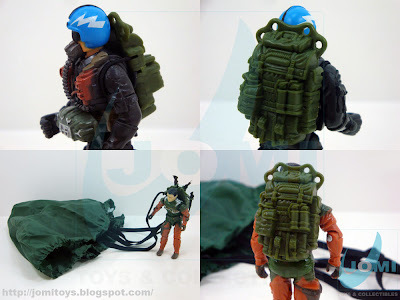 And it looks cool with this backpack too! I really like the blue helmet and idea of a Peace Force. That's what makes me like Chap Mei line, always taking advantage of facts that are going one.